The British Racing Drivers’ Club (BRDC) celebrated motor racing achievements of 2010 today (Monday 06 December), at the star-studded BRDC Annual Awards. The ceremony, hosted by BBC Formula 1 presenter Jake Humphrey, was attended by motor racing’s finest, including three of the BRDC’s Knights of the Realm – Sir Stirling Moss OBE, Sir Jackie Stewart OBE and Sir Frank Williams CBE. World Champions Nigel Mansell OBE, Andy Priaulx MBE, David Richards CBE, Christian Horner and Damon Hill OBE, who is also President of the BRDC, were also in attendance. Formula 1 driver Mark Webber just managed to beat World Touring Car driver Andy Priaulx to the BRDC’s premier annual award, the BRDC Gold Star. The Gold Star was one of two Awards for the Australian driver, while British Touring Car Championship driver Gordon Shedden received the Club’s highest accolade for national racing, the BRDC Silver Star. The outstanding achievements of Dario Franchitti were also recognised at this year’s Awards. 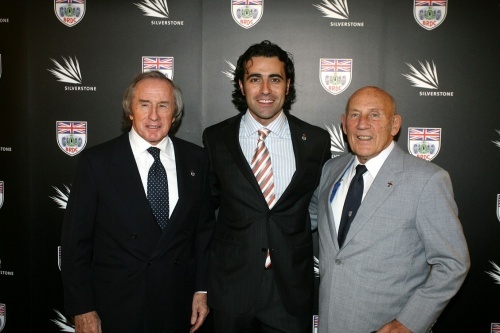 BRDC Vice President Sir Jackie Stewart OBE presented the British driver with a BRDC ‘Special’ Gold Star after Franchitti secured his third IndyCar Series Drivers’ Championship in 2010, along with his second Indianapolis 500 race win. The achievements of Britain’s two Formula 1 drivers, Lewis Hamilton MBE and Jenson Button MBE, were recognised, with the two BRDC Members being awarded the Graham Hill and ERA Club trophies respectively. Neither was able to collect their award in person, however, both drivers had pre-recorded acceptance speeches. Red Bull’s Formula 1 success was further celebrated by Adrian Newey who collected The Sir Jackie Stewart Award, presented annually to a motor sport engineer who has shown brilliance during the course of the season. The courage and bravery of BRDC Vice President for Life, Sir Stirling Moss was also acknowledged by his racing peers and colleagues. The 81-year-old British racing icon was awarded The Innes Ireland Trophy following his recovery from serious injury and his return to the track earlier in the year. Sir Jackie Stewart’s exceptional contribution to the BRDC and motor racing as a sport was also recognised, with the Scot being awarded a BRDC Gold Medal. First presented in 1929. The BRDC Gold Star is the Club’s premier annual award. Awarded for an exceptional achievement in motor sport. The BRDC’s highest recognition of achievement in, and contribution to, the Club and the sport of motor racing. Awarded annually to a competitor within the British F3 Championship who has shown potential to become a future World Champion.